Storage Instruction: Store in a cool dry place. Consume immediately after opening. Ingredients: Water, Fructose, Sugar, Lychee Juice (2.8%), Apple Juice, Thickening Agent (E407), Konjac Powder, Antioxidants (E331, E330), Lychee Flavouring (0.5%). 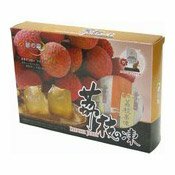 Simply enter your details below and we will send you an e-mail when “Litchi Jelly (Lychee) (荔枝啫喱)” is back in stock!